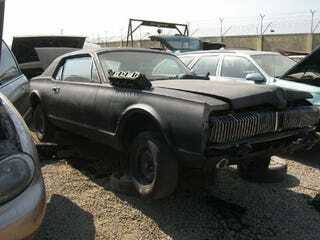 Remember the 1967 Mercury Cougar we saw down on the Alameda street, just a little over a week ago? Well, I was shopping for some race-car pieces at an Oakland self-service junkyard yesterday when I spotted a primer-black Cougar that looked very familiar. Yes, just weeks after this 41-year-old car had been holding the Mercury flag high, that mean ol' tow truck hauled it away (I took the photographs in late July). I suspect the car was bought by the owner of the beater '68 Mustang as a parts car and then scrapped after being picked over like a leftover Thanksgiving turkey. Make the jump to see all the photos, before and after.